Ford has been on quite a roll lately. The new Focus has been garnering applause left and right, the Fiesta is cute, fun to drive, and cheap, and the new Mustang is more fun than a barrel of monkeys. However, their volume model, the Fusion, has been quietly winning sales races and national awards since it was launched for the 2010 model year. 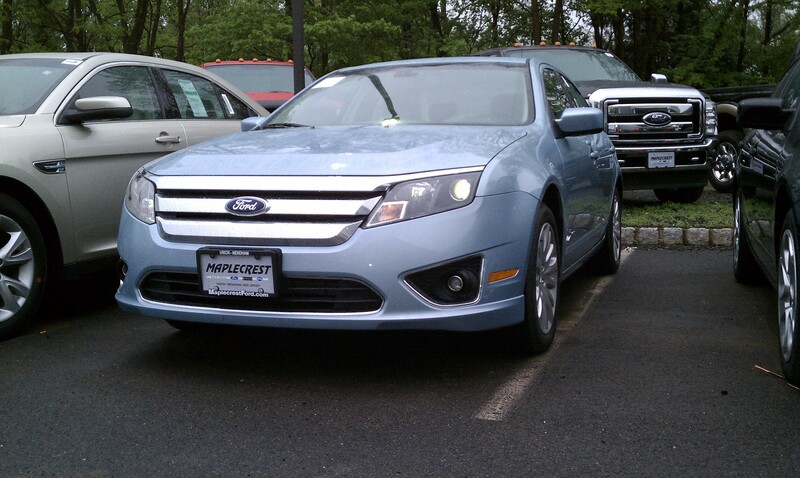 Motor Trend awarded the 2010 Fusion lineup their coveted Car of the Year award. The hybrid, however, has been the real winner of the group lately, taking home no less than 10 awards over the course of 2010. My test car was a 2011 Fusion Hybrid with “Rapid-Spec 501A”, which included all standard features, plus a reverse-camera, moon roof, Sony audio system, blind-spot detection, and rear-obstacle detection. The sticker price was $30,910—not a small amount of cash, but after a decent drive, the price began to make a lot more sense. The Fusion starts with an excellent interior design. The center stack is reasonably well laid-out and the redundant steering wheel controls are easy to understand and a snap to decipher. The backup camera on the test car used a rearview mirror display, as this car was not equipped with the navigation system. The Fusion comes standard with very comfortable cloth buckets. The power driver seat does not include a memory function, but does have full lumbar adjustment, something the Camry lacks—this is quite a boon for the enthusiast driver and actually offers a nice insight into what Ford was thinking during this car’s design stages. The instrument panel consists of only a speedometer, flanked by two LCD screens , one with fuel economy information, the other with the much-applauded “branch and leaves” system. The leaves grow along the branch as you drive more economically, and fall off when stop driving like Grandma and drive like Andretti. It’s a great game and I think it will possibly make owners drive more efficiently. The Fusion uses cloth upholstery recycled from water bottles, but you would never know from sitting on it. The process must be extremely painstaking, but it pays off nicely and will definitely woo more environmentalists. The car feels comfortable on the move, with acceleration that feels stronger than the Camry I’m used to. The engine is muted nicely but still emits a pleasant growl when pushed. The transition between electric and IC engines is seamless—exactly what buyers of these cars want. Ford’s done a good job here, but the best part is that it didn’t feel one bit like a Camry. The steering was direct and actually very responsive for a hybrid sedan. During a quick figure-8 test in a gravel ditch, the car went directly where it was pointed without spinning its tires. It rides nicely as well. Plainly, the price difference went straight into the hearts of enthusiasts—this car handles better than any hybrid sedan in its price class. Gripes? Well, a few. The rear seat room is surprisingly pokey for a person of my size; I’m 5 foot 3 and when sitting behind my 5 foot 10 father, I felt a bit cramped. The rear seats do not fold down because the battery is bolted to it (the Camry and Sonata have a folding rear seat, so the battery is mounted in a different position). However, it has more trunk space than the Toyota. SUM UP: Normally, paying more money will initially scare someone off. But, Ford’s somehow avoided that–you’re paying a little extra for more features and a much better chassis. Keep it up, Ford.